Battery and wireless sensor for temperature and fan control in connection with the receiving interfaces SRC-x and higher graded control systems. 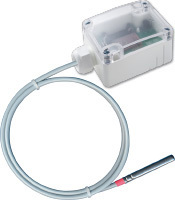 Temperature measurement in gaseous media of heating, cooling or airconditioning systems (e.g. fresh air/ exhaust air ducts). Detection of measuring values via the higher-graded control system. Transmission to receiver by means of radio telegrams according to EnOcean standard (STM telegrams 4BS). With integrated temperature sensor and solar energy storage for maintenance-free operation. Different cable temperature sensor lenghts are availables (50mm to 250mm). All types are also available with battery (type BAT) instead of solar powered energy storage. T_send = 100sec. wake up x 10 interval = 1000sec. = approx. 16 Min.